Today, Mayor Mike Bloomberg announced a deal to build an electrical station — the first of its kind on the East Coast — at the Brooklyn Cruise Terminal in Red Hook so that massive luxury cruise ships can turn off their engines and plug into the electrical grid instead of idling and burning diesel fuel while docked. The move will save Red Hook, Carroll Gardens and the surrounding area from cruise ship emissions — the No. 1 source of air pollution over the Brooklyn waterfront. South Brooklyn Post was the first, in November, to write about significant air pollution caused by cruise ships docking at the Brooklyn Cruise Terminal in Red Hook, and the money battle between the city, state and Carnival Cruise ships over who would pay the additional electricity bills. Under this new agreement, construction will begin this summer and the electrical plug in station will be complete by 2012, Bloomberg’s office said. Carnival will pay $4 million to retrofit its ships, and the city and the state power authority will provide power at a discounted rate, a value of about $2 million a year, Bloomberg said. Last year the Port Authority of New York and New Jersey and the U.S. Environmental Protection Agency set aside $15 million to build the so-called “shore power” station, the likes of which can be found in San Francisco, Alaska, and in Europe. But the city and the New York State Power Authority, and the N.Y. Public Service Commission, which sets utility rates, battled over how to pay the electricity bill. Local state Sen. Daniel Squadron, City Council member Brad Lander, and Congresswoman Nydia Velazquez, along with Port Authority Executive Director Christopher Ward and other officials, pushed for a deal for two years. The partnership will bring New York City closer to its goal of reducing fossil fuel emissions, and achieving “the best air quality of any major city in the nation” by 2030, according to Bloomberg’s press release Wednesday. Bloomberg’s office said that ships typically berth for up to 11 hours while loading and unloading passengers and supplies. 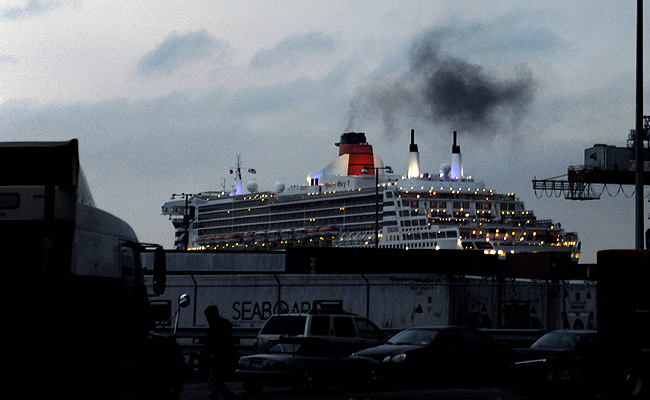 The Queen Mary 2, Caribbean Princess and Emerald Princess will save the local air space 1,500 tons of carbon dioxide, 95 tons of nitrous oxide and 6.5 tons of particulate matter annually, by plugging in, the mayor’s office said. Carnival Cruise Lines also now will be required to use “progressively lower-sulfur fuel for its ships,” Bloomberg’s statement reads. Currently, the cruise ships use the least expensive form of diesel fuel available, called bunker fuel, which is tax free in New York. “Diesel exhaust poses serious health risks, including increasing the risk of cancer and aggravating the symptoms of asthma,” said Judith Enck, U.S. EPA Regional Administrator. The EPA provided $2.9 million in American Recovery and Reinvestment Act money for the shore power project in Red Hook. Bloomberg’s statement points out a recent study by the city Economic Development Corporation, which found that cruise passengers and crew spent $145 million in the city last year, and that the city’s cruise business continues to grow. The Manhattan and Brooklyn cruise terminals saw 445,718 passengers in 2009, and 582,979 in 2010. The shore power deal was not easy, and is a big victory for city and state leaders, said several local politicians. Much credit should be given to local Red Hook blogger, and PS 58 dad, Adam Armstrong, who launched his blog, A View From the Hook, to publicize this issue. He hounded and pounded and is credited by local officials with increasing education and awareness of the issue. Read South Brooklyn Post’s exclusive story from November. Also check out our piece on Carnival Cruise and the money issue regarding what’s called in the industry “shore power,” or “cold-ironing,” or, plugging in to shore-based electrical power.